What on Earth is this, you ask? 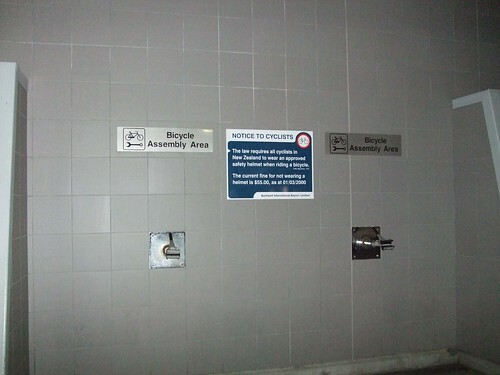 It is the bicycle assembly station in the international terminal at Auckland, New Zealand’s airport…how cool is that?!? New Zealand is widely regarded as one of (if not THE) ultimate destinations for bicycle tourists — good climate, friendly people, stunning vistas. 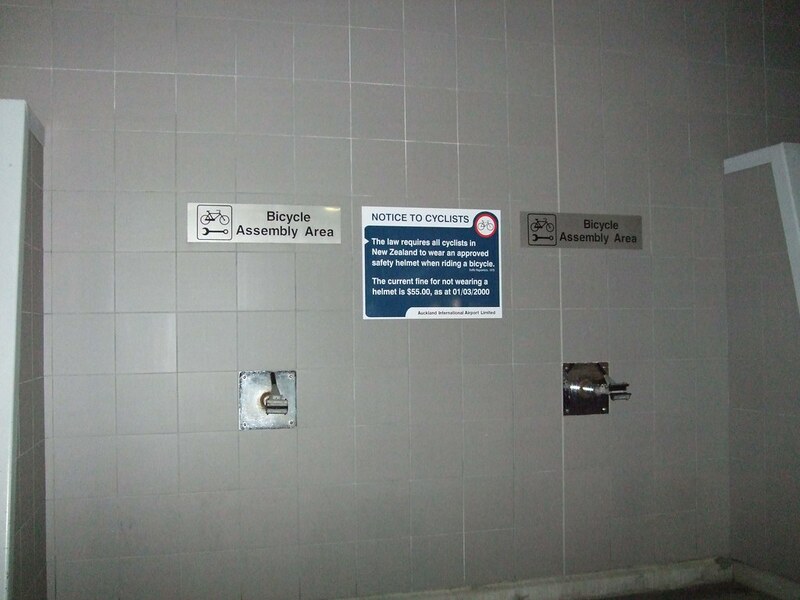 If the airport there (and it is reported that the airport in Christchurch also has one of these stations) made the effort to secure a special spot for traveling bicyclists to reassemble their bikes, you can be sure the rest of the trip will be a smashing success. Christchurch(complete with a photo of their facility). Anyone seen ANYTHING like this in a U.S. airport? I sure haven’t. If anyone has run across a similar facility in their world travels, let us know. I have heard good things and bad things about cycle touring in New Zealand. Apparently a very negative recent development has been giant logging trucks that have been terrifying cycle tourists out on the country roads. A British woman recently wrote a book about her bike tour of New Zealand and said it is not the cyclist’s paradise it once was. Stuart, how is that any different than the logging trucks in east Texas? I spent 4 days feeling like I was the lead character in a Frogger game trying to dodge those 18 wheelers and they enjoyed every minute of it. That is a cool setup to have at the airport though. I see by that photo that NZ has a mandatory helmet law too. I see a guy in Postal kit every morning that would not like that law. Funny thing is he usually has his helmet strapped to his handlebars. Unless he’s climbing Hautacam I’m not sure what’s going on. I’d never seen or heard of bike stations in the airport though. Very cool…if I traveled. Logging trucks can be pretty intimidating on the back roads. They’re really only a big thing in some parts of the South Island, though. The rest of the place, you just have to deal with our aggressive drivers and odd right of way laws. 😉 But we do have some very nice riding around here – lots of scenery, lots of hills, lots of forest. The airport here in Calgary, Alberta, Canada, has a bike assembly station at the south end of Terminal A just outside the door to the street. It was provided courtesy of Elbow Valley Cycling Club. Ride…very cool — thanks for the heads-up!